It’s mid January, which means Christmas is over, the decorations are down, everyone is either vegan, or vegetarian or not drinking for the month and your bin collections are back to normal. It also means that Caribbean Chocolate Cake stocks are all but gone. We don’t know about you guys, but that leaves a big void that needed filling. Good news then, we’ve got two amazing new dark beers to tell you about. First up, Strawberry Praline, part of a duo of collabs we’re brewing with the wonderful Track. 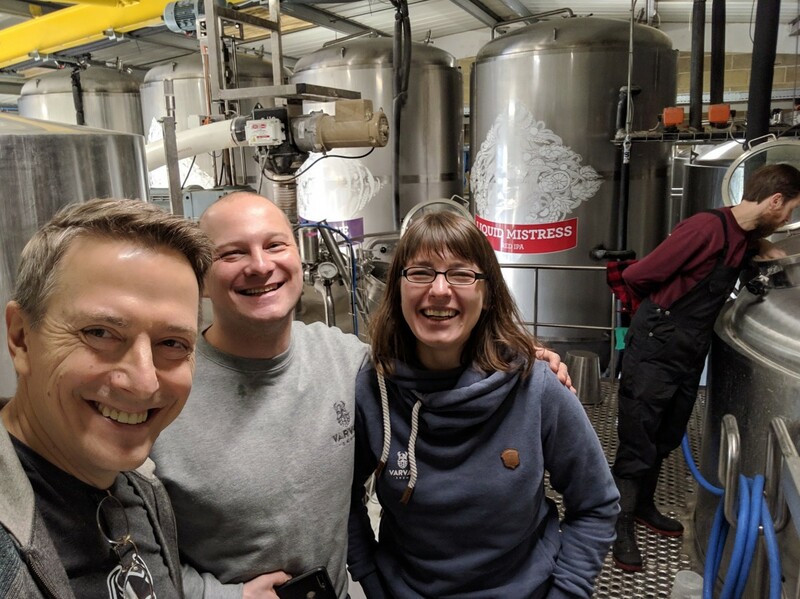 We welcomed them down to Finchampstead to brew a dark beer, and soon we’ll be heading up to them to brew a light beer. As is normally the case with collabs, we went back and forward on a few recipe ideas, but we all liked the idea of using Strawberries and Hazelnuts. Who doesn’t like a fruit and nut combination? To drive those flavours we sourced strawberry puree and an allergen-free hazelnut extract. We cold steeped dark roasted malt to encourage some more milk chocolate flavours, which combined with the hazelnut gives an amazingly creamy Nutella-esque vibe. After a double mash for high extract, we fermented with our house strain of yeast, Vermont, and hopped with orange-forward hops cascade and mandarina. The strawberry puree went in towards the end of fermentation, to retain those beautifully sweet berry notes. After an extended maturation process, to ensure flavour quality, we added a fairly large hit of the hazelnut extract to round the final beer out with correct balance. Strawberry Praline will be available soon! The eagle-eyed among you, who follow our social channels will have seen the keg badge for this already. If you’ve not heard of Varvar, they hail from Ukraine. They brew a great range of styles and are true champions of Eastern European beer. Last year at Tilquin English Beer Festival in Belgium, Kyle met Lana from Varvar. Lana says that a number of them at Varvar had an infatuation with Siren after trying Liquid Mistress at one of their bottle-shares. They’ve been looking for more Sirens at beer shops or festivals ever since. At the festival, we exchanged some beers. After cracking open a coconut porter called ‘Caribbean Dream’, we were blown away by the absolute perfect expression of coconut in beer. Kyle had been planning a coconut IPA (Later to become Hawaiian Shake) and reached out to Varvar for advice. One thing led to another and the idea of a collab was born. The initial plan was a mash up of our Broken Dream, and their Caribbean Dream, although from our perspective we didn’t want a ‘Broken Caribbean Dream’ getting confused with our own Caribbean Chocolate Cake. We agreed on a recipe, including some new techniques for both of us, decided to go imperial and their flights were booked: the brew was on! Lana says that they had a real blast brewing in the UK. The chance to gain exposure to the UK craft market was nearly as exciting as visiting the old pubs in our area and trying out some of the traditional cask ales. At some stage, we hope to be able to head out to brew Mavka in Ukraine with Varvar! The coconut shines through in such a friendly way that even if you hated coconut, you’d still accept it and enjoy it. There’s chocolate notes and big gorgeous flavours that just leave you wanting more. For an 11.4% imperial porter, this one is really drinkable. Mavka will be an online exclusive to our e-mail subscribers TODAY (Wednesday January 16th), so if you haven’t signed up yet, do it now. It will be in the Tap Yard this weekend, and online and out to bars and bottle shops from next week. Get it whilst you can. Scroll down to sign up to the e-mails!